The aim of the Peterson Creek Wildlife Corridor Project is to establish connectivity between Crater Lakes (Lake Eacham section) at the western and Curtain Fig/Yungaburra National Parks (NP) at the eastern end. This is achieved through creating a continuous corridor of forest along Peterson Creek and providing stepping-stones of habitat. These National Parks are within the Wet Tropics World Heritage area and conserve rainforest (complex vine forest, see Regional ecosystem). However, the two areas are relatively small (each around 500 hectares) and about 5 km apart. 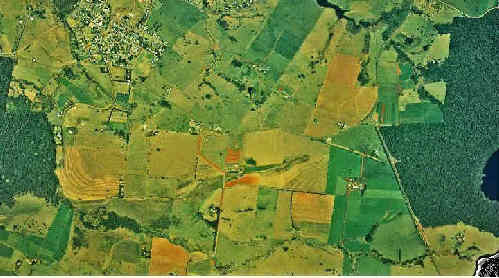 Before the start of the project, the cleared farmland separating them (see aerial photo below) restricted the ability of many species to move through the landscape. For example, Lumholtz's Tree Kangaroo is common in Curtain Fig/Yungaburra NP but rarely seen at Lake Eacham. Linking the Parks with rainforest and planting along Peterson Creek will improve sustainability of wildlife populations. For example, Tree Kangaroos are now commonly seen about halfway along the corridor that the Project has established. The Peterson Creek revegetation project started in 1998, and to date (July 2018) around 100,000 trees have been planted. Up to 1.5 hectares have been planted each year (at a density of 3,000 to 3,500 trees per hectare). All trees planted are locally occurring native species from the locally occurring forest types (The full list of species - species list). Some Vulnerable and Near Threatened tree species have been included in the planting, such as Tree waratah (Alloxylon flammeum), Lacewood (Firmiana papuanum), and Coorangooloo Quandong (Elaeocarpus coorangooloo). Experience showed the necessity of placing tree guards around some of the more frost sensitive species during the winter months. 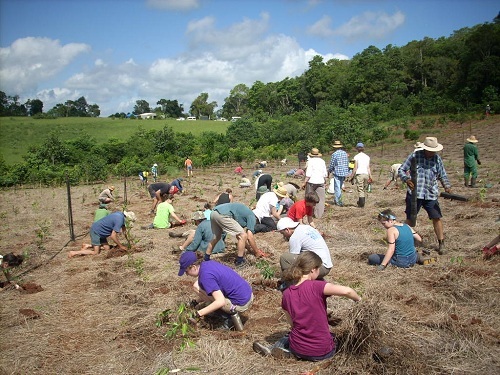 The Project has been a joint initiative between the Queensland Parks and Wildlife Service (QPWS) (Restoration Services), our community tree planting group TREAT (Trees for the Evelyn and Atherton Tablelands) and landholders along Peterson Creek (with participation from the Byrnes, Burchill, Freeman, Hoare, Howe, Metes, Mathers, Palumbo, de Tournouer and Williams families). It has been supported by QPWS and Queensland Government grant funding. 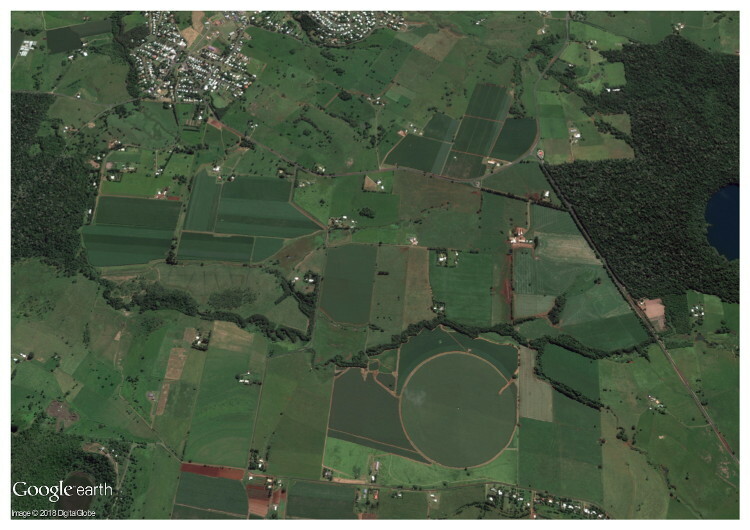 The two photos above show the progress of the project - the top photo shows the landscape in 1997, before the start of the project. The photo below shows the Corridor we have created. Besides providing habitat for native fauna and flora, the plantings have improved water quality in Peterson Creek through shade (lowered water temperature) and decreased sediment and chemical runoff. The trees also provide shade and protection for stock on the farms along the Corridor. The Peterson Creek Wildlife Corridor Project provides an example of government, community and landholders working together to achieve benefits for biodiversity conservation. 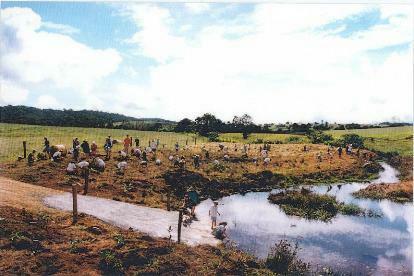 Photo of Peterson Creek Project taken in April 2002. Photos of Peterson Creek Project taken in May 2006 by Lars Kazmeier & G. Vick.